This research was commissioned by the World Humanitarian Summit (WHS) Innovation Team, which I joined last year. An important goal of the Summit’s Innovation Team is to identify concrete innovation pathways that can transform the humanitarian industry into a more effective, scalable and agile sector. I have found that discussions on humanitarian innovation can sometimes tend towards conceptual, abstract and academic questions. This explains why I took a different approach vis-a-vis my contribution to the WHS Innovation Track. The handbook below provides practical collaboration guidelines for both humanitarian organizations & computing research institutes on how to catalyze humanitarian innovation through successful partnerships. These actionable guidelines are directly applicable now and draw on extensive interviews with leading humanitarian groups and CRI’s including the International Committee of the Red Cross (ICRC), United Nations Office for the Coordination of Humanitarian Affairs (OCHA), United Nations Children’s Fund (UNICEF), United Nations High Commissioner for Refugees (UNHCR), UN Global Pulse, Carnegie Melon University (CMU), International Business Machines (IBM), Microsoft Research, Data Science for Social Good Program at the University of Chicago and others. This handbook, which is the first of its kind, also draws directly on years of experience and lessons learned from the Qatar Computing Research Institute’s (QCRI) active collaboration and unique partnerships with multiple international humanitarian organizations. The aim of this blog post is to actively solicit feedback on this first, complete working draft, which is available here as an open and editable Google Doc. So if you’re interested in sharing your insights, kindly insert your suggestions and questions by using the Insert/Comments feature. Please do not edit the text directly. I need to submit the final version of this report on July 1, so very much welcome constructive feedback via the Google Doc before this deadline. Thank you! The World Humanitarian Summit (WHS) is an initiative by United Nations Secretary-General Ban Ki-moon to improve humanitarian action. The Summit, which is to be held in 2016, stands to be one of the most important humanitarian conferences in a decade. One key pillar of WHS is humanitarian innovation. “Transformation through Innovation” is the WHS Working Group dedicated to transforming humanitarian action by focusing explicitly on innovation. I have the pleasure of being a member of this working group where my contribution focuses on the role of new technologies, data science and advanced computing. As such, I’m working on an applied study to explore the role of computing research institutes as an innovation pathway for humanitarian technology. The purpose of this blog post is to invite feedback on the ideas presented below. I first realized that the humanitarian community faced a “Big Data” challenge in 2010, just months after I had joined Ushahidi as Director of Crisis Mapping, and just months after co-founding CrisisMappers: The Humanitarian Technology Network. The devastating Haiti Earthquake resulted in a massive overflow of information generated via mainstream news, social media, text messages and satellite imagery. I launched and spearheaded the Haiti Crisis Map at the time and together with hundreds of digital volunteers from all around the world went head-to head with Big Data. As noted in my forthcoming book, we realized there and then that crowdsourcing and mapping software alone were no match for Big (Crisis) Data. This explains why I decided to join an advanced computing research institute, namely QCRI. It was clear to me after Haiti that humanitarian organizations had to partner directly with advanced computing experts to manage the new Big Data challenge in disaster response. So I “embedded” myself in an institute with leading experts in Big Data Analytics, Data Science and Social Computing. I believe that computing research institutes (CRI’s) can & must play an important role in fostering innovation in next generation humanitarian technology by partnering with humanitarian organizations on research & development (R&D). There is already some evidence to support this proposition. We (QCRI) teamed up with the UN Office for the Coordination of Humanitarian Affairs (OCHA) to create the Artificial Intelligence for Disaster Response platform, AIDR as well as MicroMappers. We are now extending AIDR to analyze text messages (SMS) in partnership with UNICEF. We are also spearheading efforts around the use and analysis of aerial imagery (captured via UAVs) for disaster response (see the Humanitarian UAV Network: UAViators). On the subject of UAVs, I believe that this new technology presents us (in the WHS Innovation team) with an ideal opportunity to analyze in “real time” how a new, disruptive technology gets adopted within the humanitarian system. In addition to UAVs, we catalyzed a partnership with Planet Labs and teamed up with Zooniverse to take satellite imagery analysis to the next level with large scale crowd computing. To this end, we are working with humanitarian organizations to enable them to make sense of Big Data generated via social media, SMS, aerial imagery & satellite imagery. The incentives for humanitarian organizations to collaborate with CRI’s are obvious, especially if the latter (like QCRI) commits to making the resulting prototypes freely accessible and open source. But why should CRI’s collaborate with humanitarian organizations in the first place? Because the latter come with real-world challenges and unique research questions that many computer scientists are very interested in for several reasons. First, carrying out scientific research on real-world problems is of interest to the vast majority of computer scientists I collaborate with, both within QCRI and beyond. These scientists want to apply their skills to make the world a better place. Second, the research questions that humanitarian organizations bring enable computer scientists to differentiate themselves in the publishing world. Third, the resulting research can help advanced the field of computer science and advanced computing. So why are we see not seeing more collaboration between CRI’s & humanitarian organizations? Because of this cognitive surplus mismatch. It takes a Director of Social Innovation (or related full-time position) to serve as a translational leader between CRI’s and humanitarian organizations. It takes someone (ideally a team) to match the problem owners and problem solvers; to facilitate and manage the collaboration between these two very different types of expertise and organizations. In sum, CRI’s can serve as an innovation pathway if the following three ingredients are in place: 1) Translation Leader; 2) Committed CRI; and 3) Committed Humanitarian Organization. These are necessary but not sufficient conditions for success. While research institutes have a comparative advantage in R&D, they are not the best place to scale humanitarian technology prototypes. In order to take these prototypes to the next level, make them sustainable and have them develop into enterprise level software, they need to be taken up by for-profit companies. The majority of CRI’s (QCRI included) actually do have a mandate to incubate start-up companies. As such, we plan to spin-off some of the above platforms as independent companies in order to scale the technologies in a robust manner. Note that the software will remain free to use for humanitarian applications; other uses of the platform will require a paid license. Therein lies the end-to-end innovation path that computing research institutes can offer humanitarian organization vis-a-vis next generation humanitarian technologies. As noted above, part of my involvement with the WHS Innovation Team entails working on an applied study to document and replicate this innovation pathway. As such, I am looking for feedback on the above as well as on the research methodology described below. Have you already partnered with humanitarian organizations? Why/why not? If you have partnered with humanitarian organizations, what was the outcome? What were the biggest challenges? Was the partnership successful? If so, why? If not, why not? If you have not yet partnered with humanitarian organizations, why not? What factors would be conducive to such partnerships and what factors serve as hurdles? What are your biggest concerns vis-a-vis working with humanitarian groups? What funding models did you explore if any? Have you already partnered with computing research groups? Why/why not? If you have partnered with computing research groups, what was the outcome? What were the biggest challenges? Was the partnership successful? If so, why? If not, why not? If you have not yet partnered with computing research groups, why not? What factors would be conducive to such partnerships and what factors serve as hurdles? What are your biggest concerns vis-a-vis working with computing research groups? My plan is to carry out the above semi-structured interviews in February-March 2015 along with secondary research. My ultimate aim with this deliverable is to develop a model to facilitate greater collaboration between computing research institutes and humanitarian organizations. To this end, I welcome feedback on all of the above (feel free to email me and/or add comments below). Thank you. Update: Crisis Map now includes features to post photos in addition to videos! The latest version of the Humanitarian UAV Network’s Crisis Map of UAV/aerial photos & videos is now live on the Network’s website. 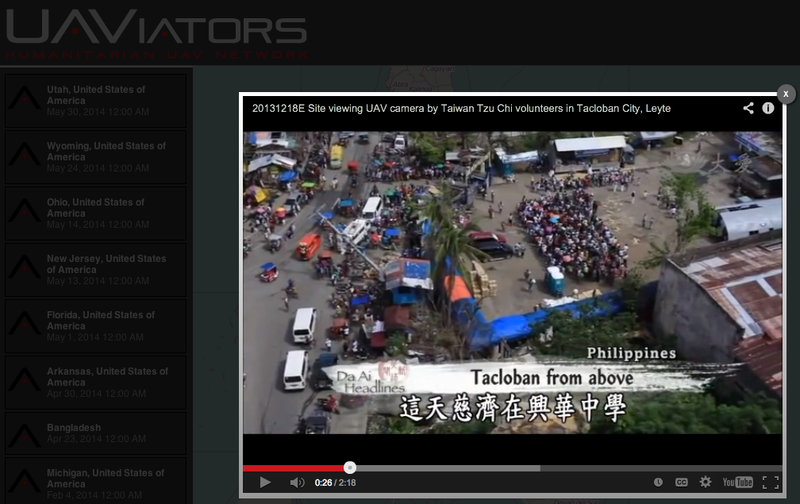 The crowdsourced map already features dozens of aerial videos of recent disasters. Now, users can also post aerial photographs areas. Like the use of social media for emergency management, this new medium—user-generated (aerial) content—can be used by humanitarian organizations to complement their damage assessments and thus improve situational awareness. The purpose of this Humanitarian UAV Network (UAViators) map is not only to provide humanitarian organizations and disaster-affected communities with an online repository of aerial information on disaster damage to augment their situational awareness; this crisis map also serves to raise awareness on how to safely & responsibly use small UAVs for rapid damage assessments. This explains why users who upload new content to the map must confirm that they have read the UAViator‘s Code of Conduct. They also have to confirm that the photos & videos conform to the Network’s mission and that they do not violate privacy or copyrights. In sum, the map seeks to crowdsource both aerial footage and critical thinking for the responsible use of UAVs in humanitarian settings. As noted above, this is the first version of the map, which means several other features are currently in the works. These new features will be rolled out incrementally over the next weeks and months. In the meantime, feel free to suggest any features you’d like to see in the comments section below. Thank you.